I like my vintage 2008 17" MacBook Pro (MBP). But it had become too tired to run Aperture and manage my extensive photo library. Rather than give up on this otherwise beautiful machine, I decided to replace the traditional hard drive with a new Crucial Solid State Drive (SSD). Now that the project is completed, I have to say, the results have exceeded my expectations. Preparing for the hard drive replacement. Other goodies include a SuperDrive for both CD and DVDs, 3 USB ports, FireWire 800 and 400 ports, plus an excellent sound system. Like I said earlier, way too good of a machine to give up on quite yet. But its Achilles heel was the 200 GB Hitachi internal hard drive. It was slowing down my entire system. Aperture in particular was painful. I could barely perform the simplest image edit without a spinning beach ball. Since Aperture is constantly hitting the hard drive, I thought moving to Solid State might help. In part, this belief stems from my excellent experience using the current MacBook Air. I thought that if I "air-i-fied" my MBP, I might be more satisfied with its performance. 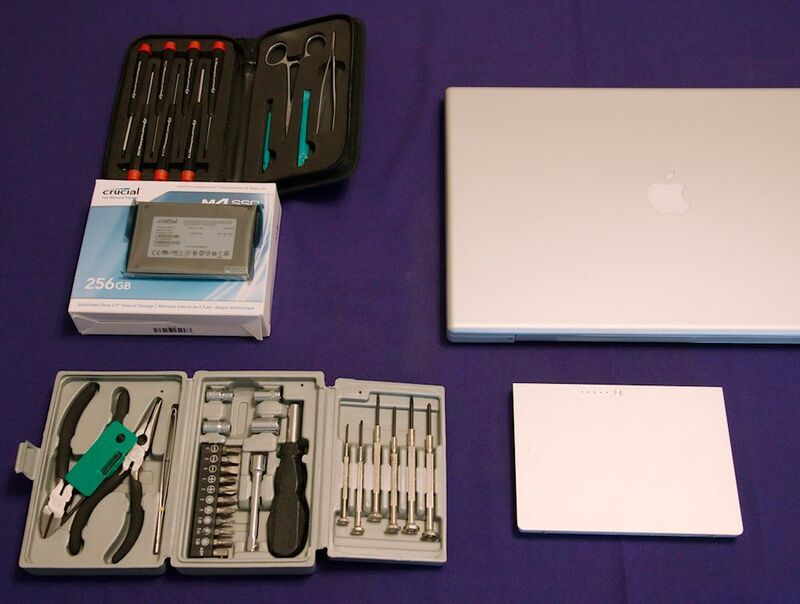 After I received the Crucial SSD, I watched "How to replace your 17" Mac Book Pro hard drive:"
Then I retrieved my Newer Tech 11-Piece Computer Tool Kit and spread everything out on a covered table. Once all the screws were removed, I was careful when lifting the keyboard. There's a ribbon cable that connects it to the mother board that I didn't want to damage. New SSD in place. Now all I have to do is put everything back together. Fortunately I have a copy of Snow Leopard on DVD, so I held down the "C" key and booted the laptop from it. I used Disk Utility to format the Crucial SSD for Mac OS X Journaled. Then I installed the operating system itself. Even though I had backed up my files on an external hard drive before installing the SSD, I still wanted that old Toshiba available in case I had forgotten something. So I pried open an LaCie Rugged portable unit that had a failed hard drive in it, pulled out the bad hard drive, and replaced it with the unit I had removed from the laptop. I now have all of my previous files available. The 2008 MacBook Pro is like a new computer. It's currently handling an Aperture library containing 50,000 referenced images with very little effort. I can now edit RAW files from my 5D Mark II without those long delays I was previously experiencing. I love working on this big boy again. The entire project cost me less than $275. (You can't get an iPad for that amount, let along a big 17" matte screen workhorse.) And performance is so much snappier than before. I'm definitely enjoying this ride. I also put a Crucial SSD in my Macbook Pro(2009), several months ago. It has also exceeded my expectations. Sometimes I am amazed at how well the machine performs. I know the hard drive does not get used for all functions but it seems to affect many of the day to day functions. In addition the SSD is very tough. My computer had a bad spill onto a parking lot months ago. It is a bit bruised but the SSD came through it with flying colors. I have a 2007 15'' Macbook Pro (2.2 Intel Core 2 Duo) and I am have been considering getting a new Macbook this year (especially because Aperture is soooo slow). Your post however got me thinking - is the performance boost so much better that it would be worth getting an SSD-drive and defer getting a new computer until next year/ in two years? I did this same upgrade as soon as I bought my new late 2011 MBP 17" last fall. The switch over to Mac from Windows is the best move I've ever made and the SSD upgrade really makes my MBP hum along fine with Photoshop CS5, Lightroom 4, etc. I also went a step further and swapped out my optical drive for the 750gb hard drive that came with my MBP. Now I've got two hard drives on board and I can still use my optical drive via USB if need be and that is not very often at all. I think I've needed it 2-3 times since removing it. My motivation for the SSD was that I want to save my "computer budget" for the next MacBook Air that comes out. With all the traveling that I do, it is really a must have for me. But when I'm in the studio, I love working on the 17" MBP. The SSD swap really invigorated that computer allowing me to hold off a bit longer before replacing it. I have a mid 2009 MBP 15", when my Apple Care runs out this summer I'm switching to an SSD as well. I'm wondering if I should also consider switching from 4GB to 8GB memory? Any thoughts would be much appreciated. Hi Ann. Yes if you run photo or movie applications 8 GB of RAM will come in very handy - and quite honestly it doesn't hurt to have extra RAM anyway So if you're upgrading your hard drive, why not? Gotta love the variety of subjects dealt with every week by TDS. Timely article... I was recently considering whether to put a SSD into my 2009 MacBook Pro which serves as my "home" computer. Thanks for sharing your experience. Thanks Derrick, that's what I was thinking too. Along with an SSD I added to my 2009 Macbook Pro 13", I added OWC's 2nd hard drive kit to replace the optical drive. I now have two drives and no optical. The 2nd hard drive is my Time Machine drive but you could also use it as an Aperture data disk. It worked so well I had to do the same to my 2008 Mac Pro. I couldn't stand my little 13" Macbook Pro being faster than my Mac Pro. Thanks for the post Derrick. How much RAM do you have in your MBP out of interest? I have 4 GBs in the 17" MBP right now. But since it's far more useful all of a sudden, I'm thinking about going to 8 GBs. Btw I note that you mentioned that you had a copy of Snow Leopard that you used as an intermediate OS in installing Lion. Next time you might consider downloading the Lion ap and making an installation CD. I did it recently when I had to reformat my harddrive and it worked well. Thanks again for all your interesting presentations. You selected a Crucial SSD. Was there a particular reason? Any sources or opinions or experience by any other readers? Great article.. went back to find it actually, after remembering you spoke it about on the podcast..
time to make the leap/learn a new workflow I suppose. Are you allowed to say WHERE you purchased the Crucial SSD drive? If I'm not game enough to install a new SSD myself, do you know whether I can pay an Apple store to do it for me? I had some severe spinning wheel issues when I upgraded my old 13-inch MBP. That was probably because of the drive though (early OCZ model). The m4 seems rock solid.